The Samba Galapagos is a true European Dutch classic, optimized and refined to sail the Galapagos Islands; she is now well regarded as an experienced Motor Sail yacht, among the best in her class. 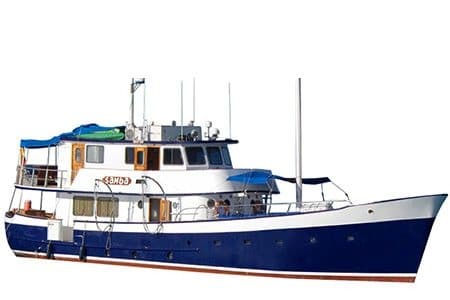 A great ocean-going sailboat with a remarkable design, she provides unique Galapagos cruising programs and boasts a special stabilizing sail. Accommodating up to 14 guests, she provides its passengers with the perfect number of fellow travelers to enjoy the magic of the Islands with privacy and flexibility. A highly experienced and friendly crew paired with a knowledgeable naturalist guide on board; are all devoted to providing guests with an exceptional experience for a trip of a life time. Itineraries are outstanding covering uncommon and vast parts of the archipelago in their Northwest programs such as Marchena Island. An incredible amount of islands in their South East Itinerary, extensively covering South, East and Central visit points, fantastic Itineraries all around.